CLEVELAND — The first two coaching candidates set to interview with the Cavaliers have no NBA head coaching experience. Mosley has some connections with the Cavs, spending four seasons as an assistant with the club before joining Dallas' staff in 2014. He just completed his fifth season with the Mavericks, who promoted him to defensive co-ordinator before last season. 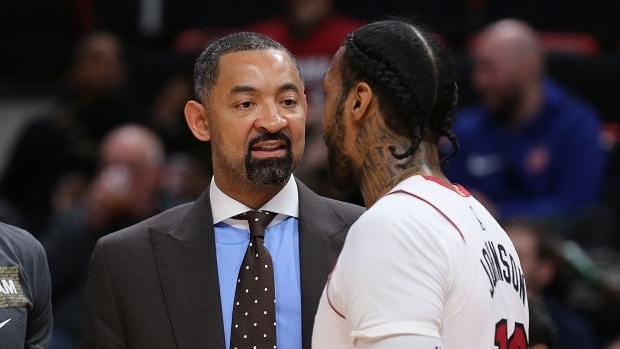 Mosley has risen through the coaching ranks and has extensive background in player development, an essential for the Cavs, who have a young roster. After a 19-year NBA playing career, Howard joined Erik Spoelstra's Heat staff in 2013. He's also been mentioned as a possible candidate for the Los Angeles Lakers' vacancy. Howard interviewed for Detroit's opening last year. The Cavs are looking for a new coach since parting last week with Larry Drew following a 19-win season. Drew took over in October after Tyronn Lue was fired and did all he could to keep the Cavs competitive amid numerous injuries and an ever-changing roster. Mosley and Howard were immediately available to meet with the Cavs because their teams are not in the playoffs. Altman and his staff intend to speak with assistants currently in the post-season, with Denver's Jordi Fernandez, Utah's Alex Jensen and Portland's David Vanterpool among the coaches expected to be contacted by the Cavs. "On our list, there are candidates that are on playoff teams," Altman said. "I'm going to be super sensitive to that. But, us being done this early affords us some time to really think this out and want to do it the right way. And being super sensitive to teams that are in the playoffs right now. I want those guys, their focus to be on helping their team right now."